On July 7, 1908, Stock Brand No. A-2722 was assigned to J. W. Te Selle by the State of Colorado. 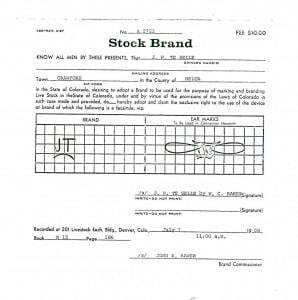 The Stock Brand Registration was recorded in Book M-15, Page 186. The fee for registration was $10.00, which gave the registered owner “exclusive right to the use of the device or brand” illustrated on the registration form. Although we do not have a copy of the signed document, apparently the document was recorded and kept by the Brand Commissioner, John E. Rawer, at the Livestock Exchange Building in Denver, Colorado.